If you do any sort of SEO Work on your site (don’t let the doomsayers scare you, if you ignore SEO you’re genuinely pants-on-head retarded), you could use tools to help you. Essential tools are limited to one – a spreadsheet program to track anything and everything. However there are tools out there that you can use to make your life easier. One of the easiest things to automate is rank tracking. With that said, because you can automate it, doesn’t mean you should. Very few rank trackers are any good. However, after rigourous testing, the most comprehensive SEO software I’ve found at a reasonable price is Advanced Web Ranking. From $99 for a 12 month maintenance licence, you get one of the most comprehensive rank trackers on the market. With that said, what do you get for your money? It’s bread and butter is it’s rank tracker. Bascially you assign it a number of keywords, search engines and what websites to search for, and the rank tracker searches for the keywords and ranks them as to where they appear in Google. In all honesty, it is quite slow – but it saves you time as you can leave it running in the background where you get onto doing other stuff. Furthermore, slow is good. Every rank checker I have seen upto this one gets crippled by Google throttling the traffic, giving inaccurate stats. Advanced Web Ranking also can detect probable competition (if different keywords result in the same website ranking, then it’s deemed competition) and rank them as a comparison. Rather than take more time over this, it tracks it along with your rankings. 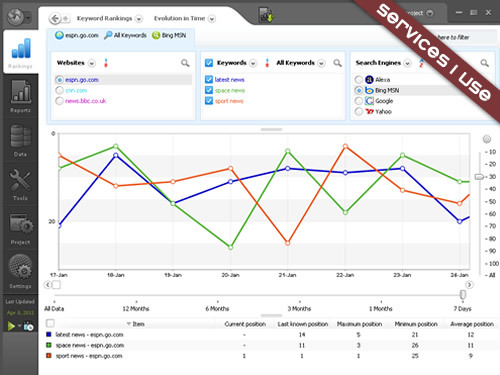 Whilst primarily being a rank tracker, there are other features associated with it that you can use. 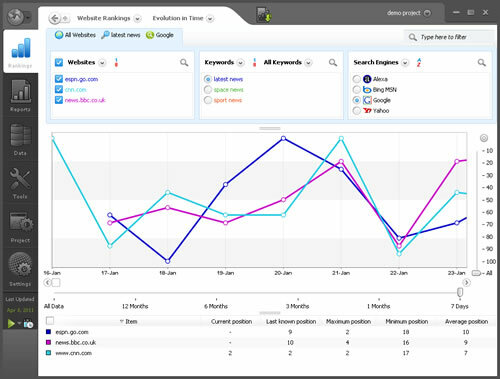 Advanced Web Ranking integrates with Google Analytics, so you can see your keywords and how they drive ranking. 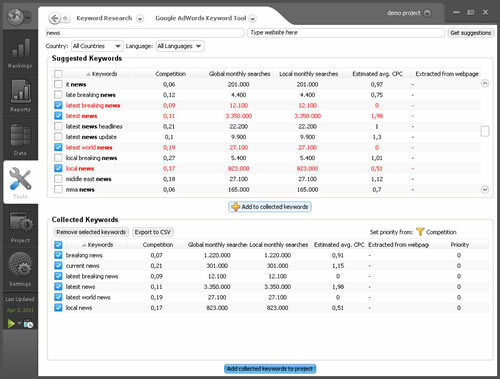 Although I didn’t really test it that well, it does appear to be pretty accurate, and highlights keywords you are tracking, which allows you to focus your link buildng efforts. The Link Tool is fascinating. Although correllation doesn’t equal causation (something very true in link building – it’s nigh on impossible to tell the effect of individual links in SEO), you can see links that you and your competitors have. This is great at acquiring “low hanging fruit” – links that your competitors may have that you don’t, that are easy to get (directories, blogs and the like). The software isn’t perfect, the user interface is a bit clunky (I couldn’t for the life of me find how to schedule tasks after creating a project). Rankings aren’t 100% accurate (though they’re pretty good), and I wouldn’t choose the website analyser over a human pair of eyes to looking over the site (though I can see the use of using it as a checker when the site is about to go live just to make sure you haven’t overlooked anything). However, for the price you pay (from $99), it’s probably the best value rank tracker out there.